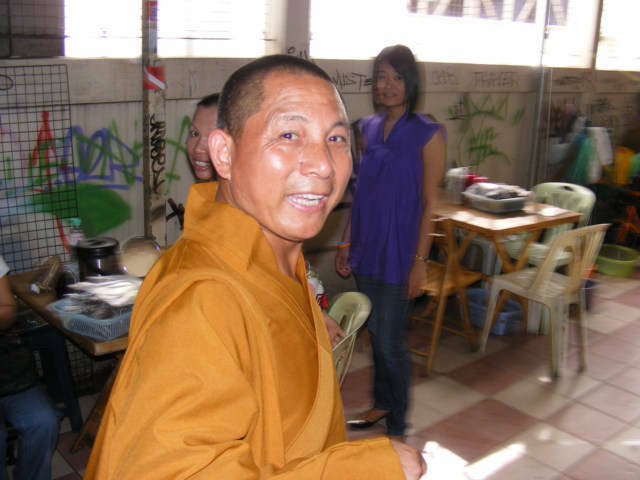 A Mafia of Fake Monks from China has entered Thailand in September of 2008. 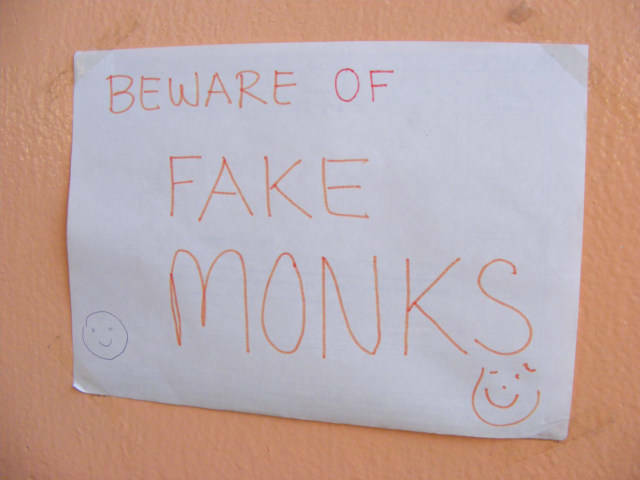 Local Thailand vendors are reporting a big jump in the number of Fake Monks. Although encountering Fake Monks has always been a small problem, as Thailand people sometime dons a robe to earn easy money by requesting alms from naive Tourist, however now it has become organized. I first became aware of this growing problem when walking into one of my favorite breakfast restaurant the Merry V Guesthouse behind the Buddhist Wat Chai Chana Songkhram. As I was eating my cheese omelet for 50 Baht I looked up from my table and see this sign. I look around and see another sign, then another, there are three of them posted inside the Guesthouse Restaurant. Then a short time later a Monk tries to enter and the fantastic breakfast waitress shoos him away. I did not put two and two together for a few days, however soon various Monks started asking me for money on my daily walk around the Khao San Road area. It is the custom of Thailand Monks to walk around near the Monastery collecting Alms in the morning from sunrise to maybe 7:30 in the morning, after this time you rarely see the Monks asking for Alms, the generally stay in the temple. Being a curious person, I started to study the differences between these new Monks and the normal Thailand Monks. I soon discovered that normal Buddhist Monks from Thailand do not collect money, except with specific license or permissions, and I not from foreigners as a general rule. These Fake Monks from China walk around during at all times of the day and walk directly up to tourist and push there bowl out to nearby Foreigners, in many way extorting money by guilt, while totally ignoring the Thailand people. Here is a video showing some real Thailand Buddhist Monks collecting foods on Thanon Kraisi near Khao San Road between sunrise and 7:30 am in Bangkok, Thailand. Please take note of the following about the real Thailand Buddhist Monks of the Khao San Road area Thailand. 1. They collect food only from Thailand people. 2. They did not approach the Thai people, they people came to them. 3. The Monk were not wearing shoes in this process. 4. The Thailand people would often kneel, and take off their shoes before making their offering. 5. No money is given to the monks. 6. The Thailand Buddhist Monks robes do not have sleeves to cover their arms. Photo taken on Thanon Kraisi near Khao San Road. One of the local vendors who is married to a Thailand women assisted me in taking this photo, as the Fake Monks only request money from the Foreigners, not from the local Thailand people. In conclusion, the solution to this problems is easy, Tourist entering Thailand need told they should not give money to Monks, please tell your friends. I hope to help Tourist and the people of Thailand by educating the world to this problem. Therefore this post is free to use in whole part online or offline providing you credit the site with a live website link when possible.